Hosted by Jon Kulp on 2019-01-29 is flagged as Clean and is released under a CC-BY-SA license. I've had this Pioneer RT-707 reel-to-reel tape deck for something like 10 years, but only recently started using it with enthusiasm. 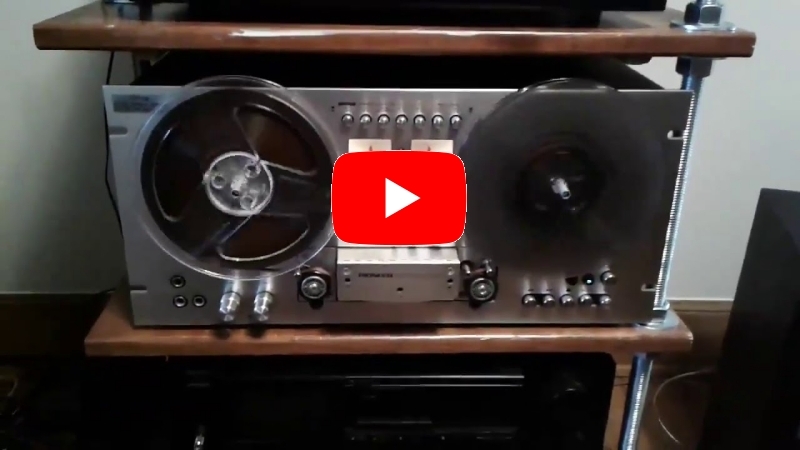 In this episode I talk about the tape deck, about the technology, and about my memories of using this kind of audio tape as a kid. 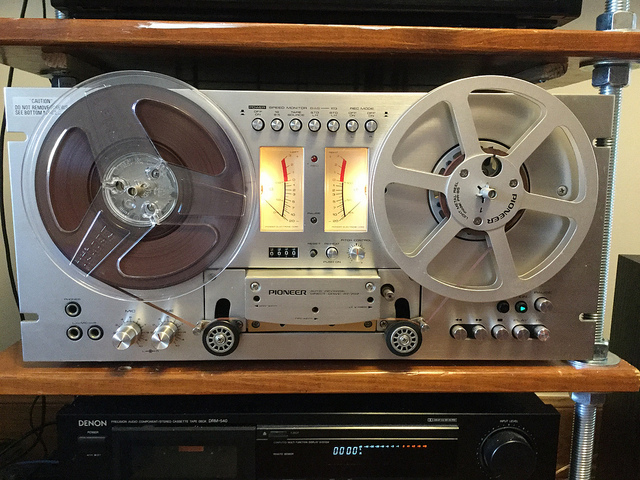 I demonstrate playback of one of my parents' mix tapes, and I also used this machine to record the last few minutes of the podcast onto a reel to reel tape, which of course I then had to transfer back to digital before submitting the show. Click image below to see a photo album relating to the tape deck. Follow-up: research on the issue indicated that a non-functional tape counter in this machine was about 99% likely to be from a broken belt. The reels are direct-drive but a belt turns the counter. I got a replacement belt from eBay and installed it today, and I'm happy to report that it works perfectly now. I just finished listening to the episode, and wow! I love finding and listening to older media. The "Crown Jewel" in my collection is an Edison Record. Sadly it came to me broken, but I do have all of the pieces and the cardboard storage cylinder is whole, so even if I do ever find a player, I couldn't play it. Thanks for your comment, Bookewyrmm. It's too bad about your Edison disc. If you enjoyed this episode about open reel tape, then you might enjoy one I did a few years ago about my Victrola in episode 1339. Incidentally I recently discovered a guy on YouTube who does amazing videos about Legacy audio formats, a user called Techmoan. These are just awesome. I highly recommend subscribing. Wow! What a beautiful tape deck! Thanks Jon. This was a wonderful voyage of nostalgia. As a teenager I had a portable Clarion tape deck (https://www.radiomuseum.org/r/gbc_clarion.html?language_id=2) which I'd bought from my cousin. It got a lot of use and I learnt how to splice tape and make tape loops back then. I'd record the latest hit records off the radio to share with friends and family. I did some basic repairs on the player, and learnt to solder when the leads and plugs needed fixing. The Clarion died eventually and probably got junked sadly. I always wanted - but never acquired - a big reel-to-reel player like a Grundig, Philips, TEAC, or whatever. Great to hear about your adventures in this area! Comparing traditional music formats, LPs, reel tapes, etc to mp3s and oggs is like comparing "dead tree" books to e-books. With books, you have the physical sensation of a paper book...The smell of the book, the feel of flipping pages. Meanwhile, with music, not only do you have the spinning tape reels and the movement of the tonearm, but more than that, analog music has more depth and richness, and is generally a warmer ambience than digital music. But at the same time, I can put several hundred thousand digital tracks onto a device which fits in my shirt pocket, and only need a pair of headphones to partake. Anyway, it is gems like this show that make me enjoy HPR. Thanks Jon! Thanks for the comments, VulcanRidr, very glad to hear you enjoyed the episode. I've seen the RT-909 that you mentioned in catalogs and on eBay, and that would be a great tape deck to have. Takes considerably more space than the 707 and probably would not fit in my stereo rack because it would need room above it for those big reels to spin. I'd love to have one, though! I believe the YouTube Techmoan host has an RT-909 in his collection. If you do pull it out of storage and set it up, I hope you will do a response episode about it. I would love to hear that.